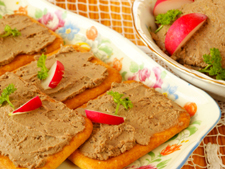 This silky-smooth pâté is inexpensive and simple to make and can last up to 2 months when frozen. The chicken livers are briefly simmered in water with aromatics before they’re blended with butter in a food processor. In a medium saucepan, combine the chicken livers, onion, garlic, bay leaf, thyme and 1/2 teaspoon of salt. Add the water and bring to a simmer. Cover, reduce the heat to low and cook, stirring occasionally, until the livers are barely pink inside, about 3 minutes. Remove from the heat and let stand, covered, for 5 minutes. Discard the bay leaf. Using a slotted spoon, transfer the livers, onion and garlic to a food processor; process until coarsely pureed. With the machine on, add the butter, 2 tablespoons at a time, until incorporated. Add the Cognac, season with salt and pepper and process until completely smooth. Scrape the pâté into 2 or 3 large ramekins. Press a piece of plastic wrap directly onto the surface of the pâté and refrigerate until firm. Serve chilled.